﻿In both England and the Colonies, the shirt was an indispensable article of clothing for men of all social classes. 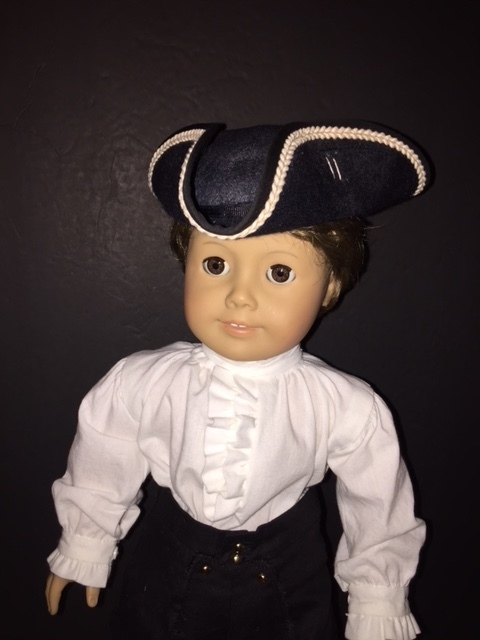 The shirts worn by George III were fashioned in the same way as the shirts worn by George Washington's personal servant and slave, William Lee. Peel away the layers of fancy court dress worn by an English nobleman or the rough hunting frock worn by an American frontiersman, and the two would look like equals. 18th century shirts were a practical garment with the particular purpose to protect a man's clothes from the dirt and grime of his body and to protect a man's body from the harsh dyes and rough fabrics of his clothes. Thimbles and Acorns 18th Century Shirt is based on the traditional pullover shirt design. The full body of the shirt gathers into the collar where it is fastened in the front with a simple button and button loop closure. The full sleeves are made extra long to enhance the fullness and fasten at the cuffs with the same button and button loop closure as at the collar. The cuffs and front opening are finished with a gentlemanly ruffle which can be omitted to create a simple working man's shirt. The distinguishing feature of this shirt is the underarm gussets which gave the wearer much more freedom of movement. Because the gussets add an additional degree of difficulty to this pattern, we've included instructions for a non-gusseted shirt that has all the charm and freedom of movement as the traditional style, without the complexity. As an added bonus, this pattern is designed with self-finishing seam allowances that are in keeping with its 18th century charm. Complete the look with the George Washington, Commander in Chief pattern. Suggested Fabrics: Shirt and Stock in lightweight cotton batiste, linen, lawn, or voile. Not suitable for knits. Synthetic blends are not recommended. -Three inches of 1/2-inch (12 mm) wide cotton twill tape OR ribbon. Perfect complement to the "George Washington, Commander-in-Chief" pattern. Well fitting. Comes in both gusseted and an easier non-gusset sleeve versions. Try the gusset one to learn a new technique. Love the way the ruffle collar is done, and love the cuffs. (You all know how I love gathering fabric!) Be sure to look at the other patterns in this series. I love them all. 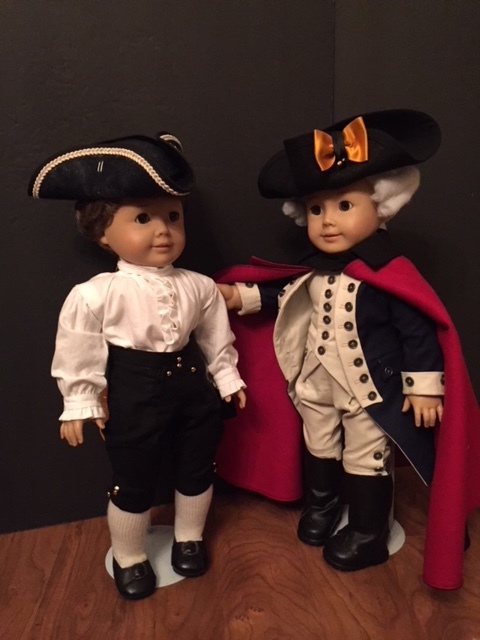 The photo below shows the doll on the left wearing the shirt and Felicity's Traveling Pants next to Thimbles' "George Washington" series pieces. The second photo is a close-up of the shirt and Thimble Tri-Corn Hat.